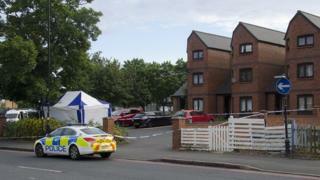 Five men have denied murdering a father-of-four during disorder in Birmingham in July. Ikram Ullah Khan, 28, known locally as Ikram Elahi, died after being stabbed in the neck in the Stratford Road area of Sparkbrook on 2 July. As well as Mr Khan, two other people were injured in the disturbance. The five all pleaded not guilty at Birmingham Crown Court and were remanded in custody. They are expected to face trial in January. Two other men charged with killing Mr Khan have yet to enter pleas. It was initially thought the victim had been shot, but post-mortem tests found his death was the result of a stab wound.